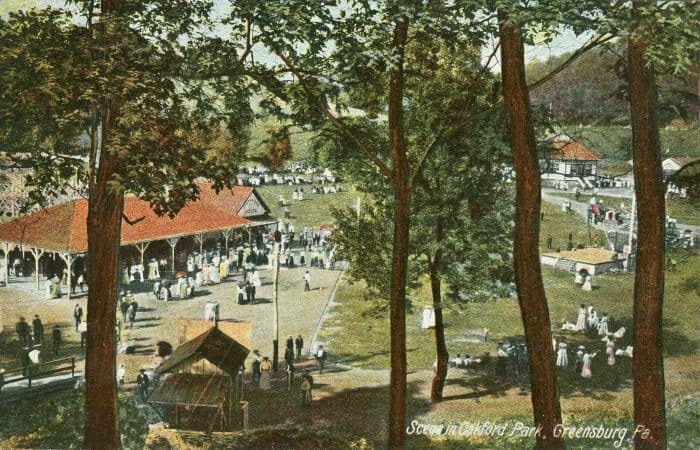 Did you know Jeannette, Pa. was once home to a popular amusement park? 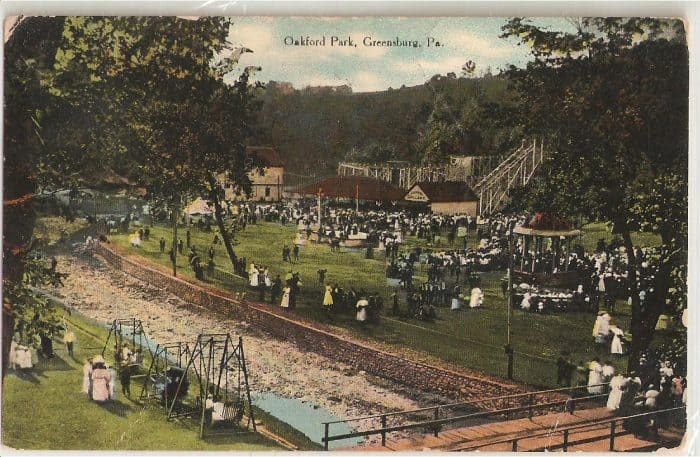 Although nature has reclaimed the land, the area once was home to Oakford Park, Greensburg and Jeannette’s very own trolley park. Where the trolleys once dropped guests off at the park, now stands a gas station. Brush Creek can be seen just beyond the miniature railroad station. 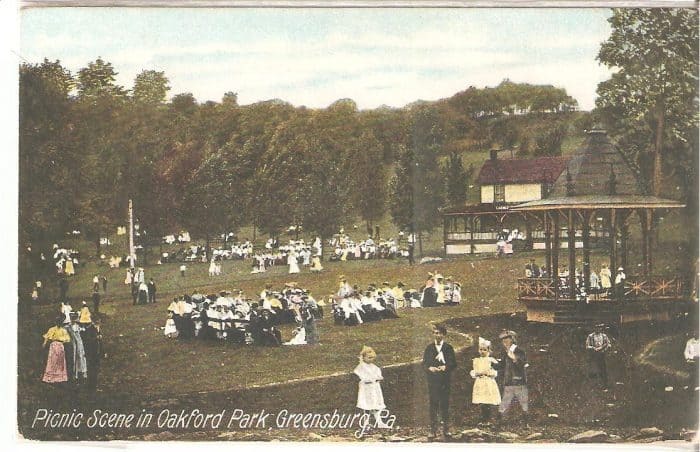 Like many of the amusement parks of yesteryear, Oakford Park in Jeannette (sometimes listed as Greensburg) started out as a trolley park. These parks were designed as picnic and recreation areas located at the ends of trolley lines. The streetcar companies usually created the parks in order to incentivize people to use the trolleys, or streetcars, over the weekend. 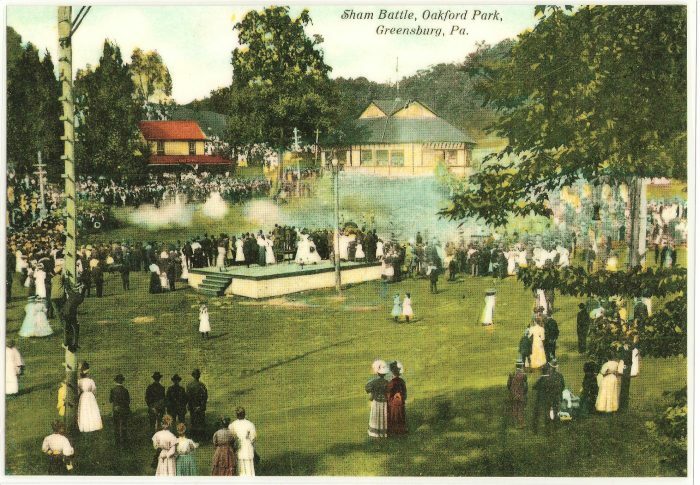 The parks originally consisted of things such as picnic groves and pavilions as well as featured events such as performances, dancing, and fireworks. Many of these parks eventually rides and attractions, making them amusement parks. 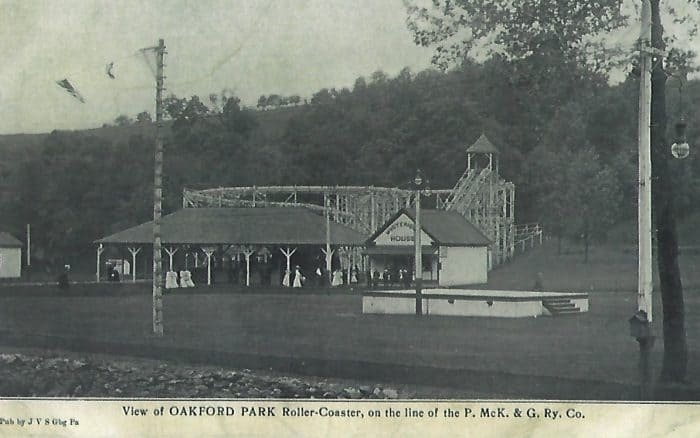 Oakford Park officially opened to the public in May of 1896. That year, a dam was constructed on the Oakford Park grounds in order to hold back the waters of Brush Creek in order to form Lake Placid. 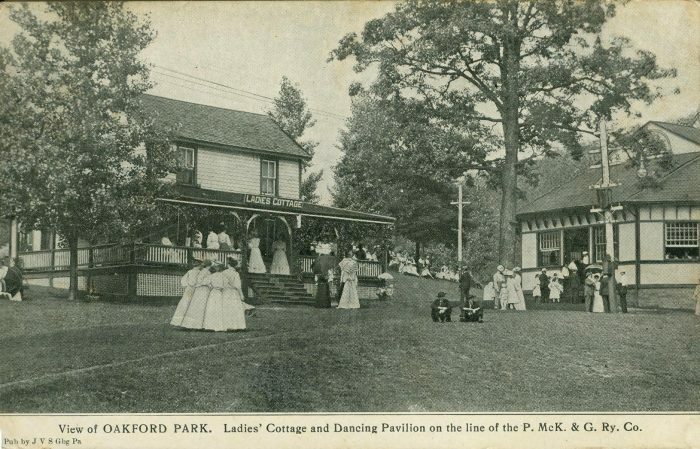 Similar to the lake at Altoona’s Lakemont Park, Lake Placid was a large draw for the park. In the summer the lake was used for boat races, rowing, and picnics. In the winter, it became an ice skater’s dream. The park enjoyed instant success, bringing in a steady stream of guests. There even have been reports of having as many as 20,000 guests in one day! In those early years a restaurant and dance hall were built. There was even a small roller coaster which was most likely an Ingersoll switch-back railway, as well as the trolley station and merry-go-round. July 5, 1903 started out as a typical day at the park with a reported 800 guests in attendance when a sudden cloud burst brought extremely heavy rains. The waters in Lake Placid began to rise, putting pressure on the Oakford Park dam. Grounds manager James McGrath, realizing the situation, began urging those who were taking shelter in the buildings to evacuate to higher ground. Water began rolling over the dam, and shortly before 4 o.m. and with a thunderous crash, the dam broke and unleashed a six-foot wall of water into the park. The water swept through the park, sweeping away its victims and lifting buildings and attractions off of their foundations. All that was left standing in the park when it was all over were the restaurant and the dance hall. The raging waters carried everything else to the next town over, creating a disaster in the city of Jeannette as well, completely wiping our their sewer system. All-in-all more than 5.5 inches of water fell on Jeannette that afternoon. There were more than 20 lives lost that day. The roller coaster, Leap Frog, can be seen on the upper right-hand side of the postcard. Oakford Park’s number one attraction was the figure-eight roller coaster, Leap Frog. In front is The Mysterious House which served as the fun house. Despite the overwhelming damage to the park and surrounding area, the park reopened in 1904. The new park featured a new figure-eight roller coaster called the Leap Frog. This coaster was similar in design to the Leap-the-Dips coaster at Lakemont Park — which is still operating. The number one attraction in the park, this roller coaster remained in the park until the park’s closure. Check out this article on Altoona’s Leap-the-Dips, the world’s largest operating roller coaster. This was the oldest building in the park as the house was there even before the park was constructed. The dancing pavilion can be seen on the right-hand side. Another notable ride that was at Oakford Park is the Circle Swing. Wicker gondolas were suspended from chains which created seats for riders. The top circle of the structure turned, spinning the riders around. It was located next to the skating rink, which were all built in the footprint of Lake Placid. Both the Leap Frog and the Circle Swing can be seen on this fire insurance map of Jeannette done in March of 1916. Other notable structures are the merry-go-round, picnic shed, dance hall, skating rink, and band stand. 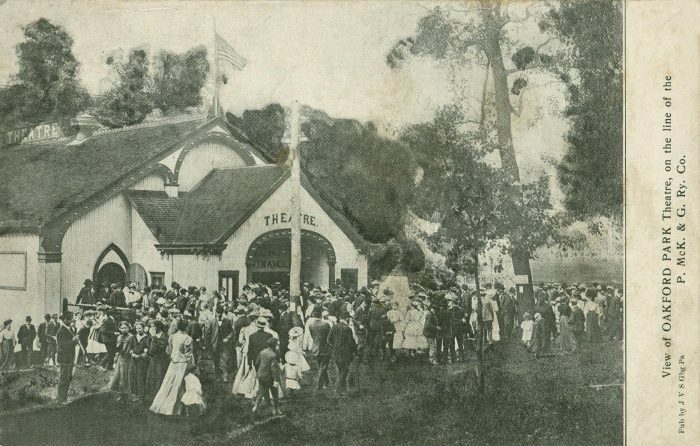 Located near the front entrance of the park, the theater was built in 1903 and had electric lighting and a massive stage. Some other rides and attractions at the park included a merry-go-round, theater, miniature railroad, and an arcade. This is a view taken from Oakford Park Road. The building seen on the left is the entrance to the roller coaster, Leap Frog. This was taken at Jeannette School District’s school picnic in 1908. Civil War reenactments used to be a yearly tradition. The battles were held on the old bed of Lake Placid. The Ladies Cottage and Dance Hall are seen in the background. The park remained in operation for another 34 years after the flood. However, like many of its trolley park counterparts, with the rise of automobiles and the fall of streetcars, traffic to the park dwindled. In 1938 the park closed. Competition from neighboring amusement parks, Kennywood and Idlewild, was also part of the reason for the closure. 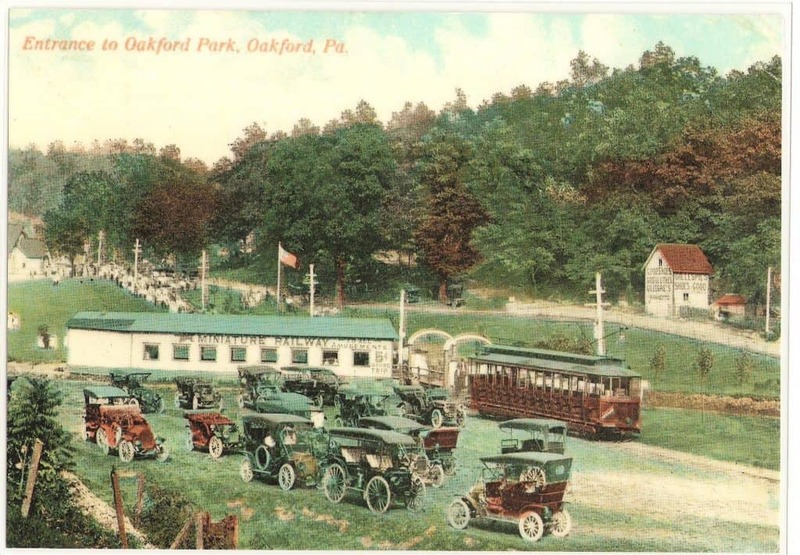 All of the assets of the park including the Caterpillar, Skooter, Aero Swing, and the Leap Frog were sold at a receiver’s sale to Olympia Park in McKeesport for only $200. 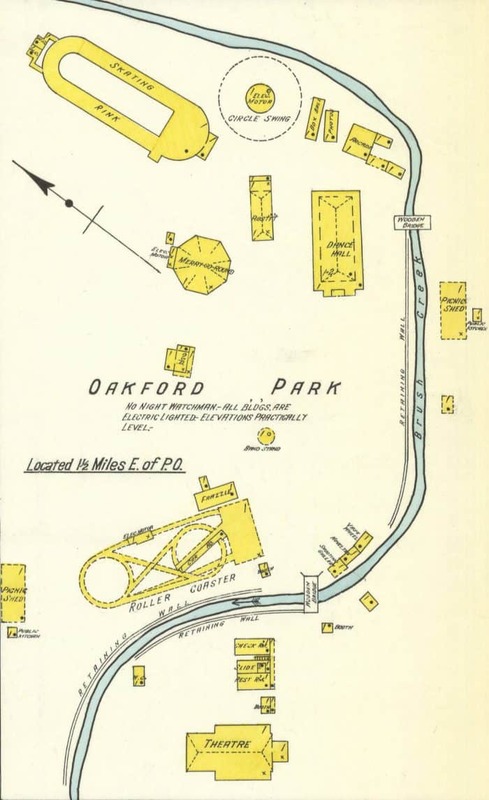 The Oakford Park swimming pool was constructed in the park in 1921. Despite the rest of the park being torn down in the 1940s, the swimming pool remained. It was purchased in 1945 from West Penn Power, but at the time there were no other structures on the property. A bathhouse had to be built in order to get the pool operational. At one time, the pool was once the largest in the state. Locals who visited the pool often recall the pool’s famous French fries made with vinegar and ketchup as well as the soft serve ice cream. The pool remained opened until the 1980s when it also closed. Remnants of the pool remained until as late as 2003 before the area was completely bulldozed over. Not much remains of Oakford Park today. You can still see the old pool gate at the Jeannette Area Historical Society though. A gas station now marks where the trolley entrance once stood. And to the very keen observer, you may notice that a brown building across the street, which is now an automotive repair shop is now, was once one a trolley shed. The only thing that remains unchanged is Brush Creek. The creek still winds through what was once the park, a silent reminder of the power of nature. My grandmother owned a carousel horse from Oakford Park. My Aunt now has the horse. Good reading. I didn’t know so many attractions were there. I remember going to the park in the middle 50’s to watch motorcycle riders ride in an enclosure on the walls. Round and round they would go coming so close to the top edge you leaned back thinking they were coming out. And grew up at the pool to the late 70’s every summer. What a great place to create memories. Very good story. I once read a while back in a local publication from Jeannette that the “Three Stooges” actually got their start at Oakford Park playing on the stage there. Apparently they had quite an act even back then. And they rented an apartment over a garage as they got their start also. Thanks again for the history!